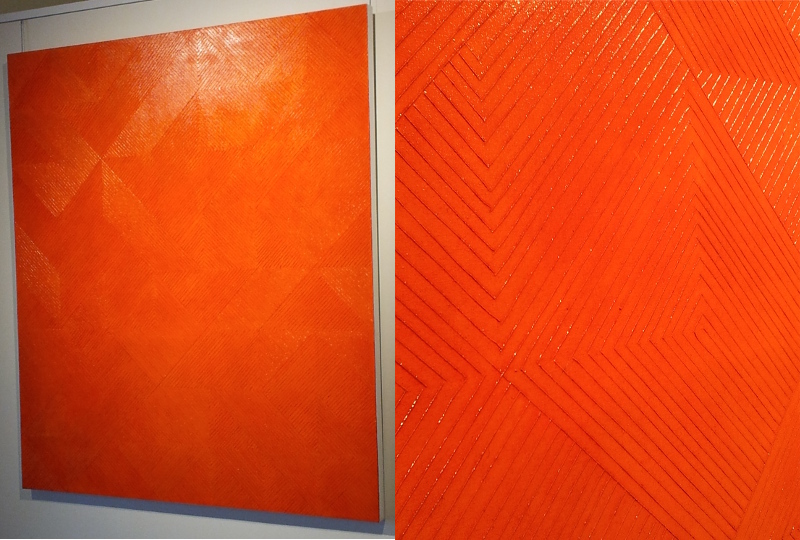 Above are two artworks by Khadim Ali, on exhibition at the Art Gallery of New South Wales (http://www.artgallery.nsw.gov.au/exhibitions/khadim-ali/) earlier this year. The image above is misleading in that the works are of totally different scale. 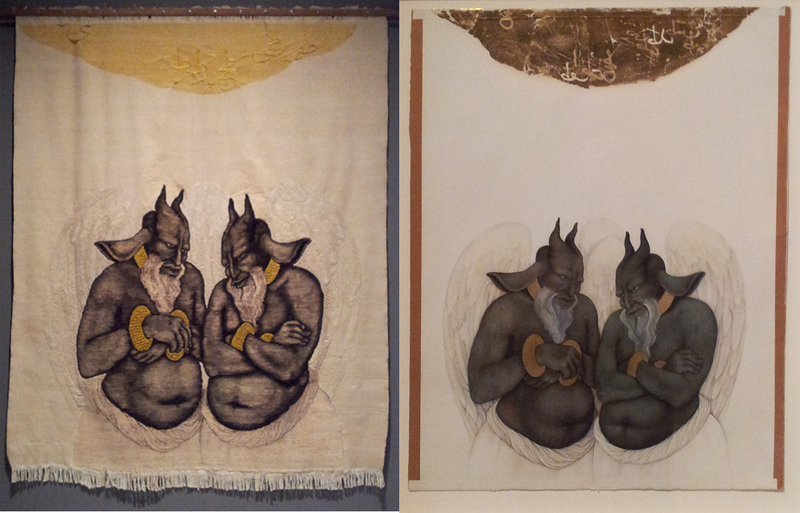 The work on the right is gouache, ink and gold leaf on wasli paper, and perhaps 34 cm high. 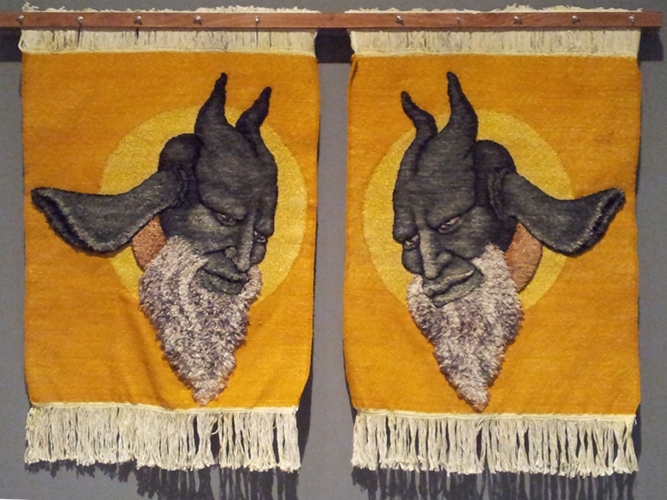 The woven wall-hanging on the left is wool and cotton, I’d say over 120 cm high. (All this is rather inexact – the individual works are untitled and I don’t have full documentation). Prior to this exhibition Ali was best known for his highly detailed miniatures. 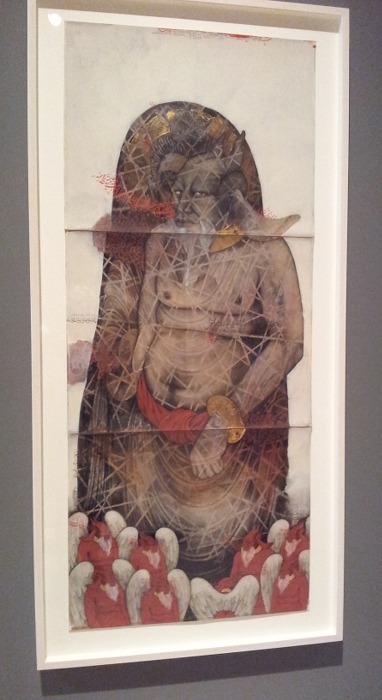 His work is full of demons and heros, often based on his interpretation of the Shahnameh, overlaid with his and his family’s personal experiences. Ali’s family were Hazara in Afghanistan – his ancestral home was Bamiyan, the site of the giant Buddha statues destroyed by the Taliban – and he grew up a refugee in Pakistan, where his family home was destroyed by a bomb set off in front of a nearby mosque. The move to include knotted rugs in his work was based on images after that bombing, when from under the rubble a red carpet was uncovered, virtually the only family treasure to survive and a link to the rug-making traditions of Afghanistan. Ali wanted to draw on that tradition, but use his own visual language. The exhibition included a series of drawings, woven works, and a digital video loop showing the dyeing of yarns and weaving. 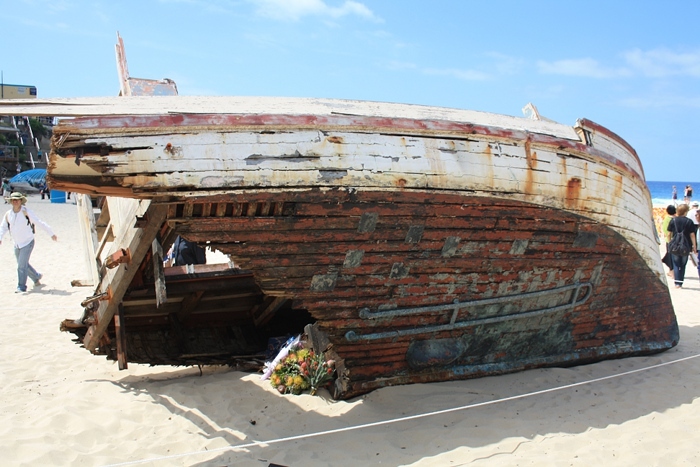 Ali Khadim tells a story of loss – of cultural heritage, of humanist values – and of seeking to understand his identity – in Afghanistan, Pakistan, and now Australia, and as Hazara. He explores shifts of meaning and perspective – who are the demons? – and the perversion of words through ideology. 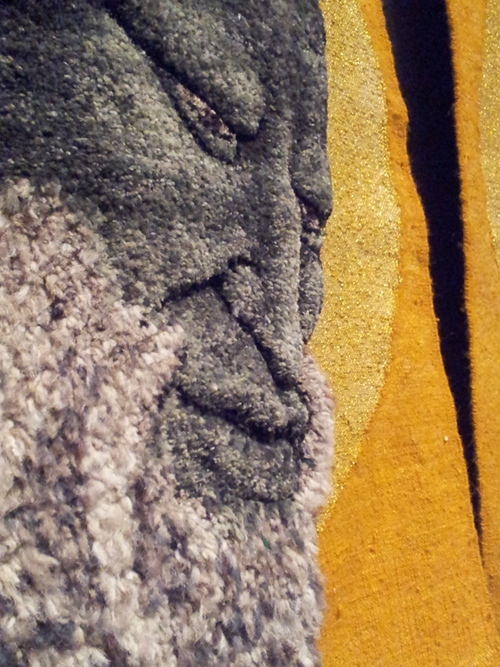 By including carpets and hangings woven in Afghanistan, he responds to his heritage, to the dangers and losses faced by his family, to their resilience and, I think, hope. I found the exhibition interesting, thought provoking and painful in itself. It was also very relevant to my musings on the use of weaving in art works (see for example 4-Oct-2014). I was able to go to a floor talk by Khadim Ali and learnt more about the actual weaving process. There were challenges finding a weaving shop in Afghanistan who were comfortable with weaving Ali’s imagery and the shading and mottling of colours, for example in the skin areas, did not fit with the traditional approach. Some embroidery and what looked to me like crochet were applied after weaving. I got the impression that they really had to work hard to get through both cultural and technical difficulties. There were areas of weft faced plain weave using different wefts right next to dense knotted areas, some of which were sculptured in clipping, other parts such as the beard left shaggy. It led to some tension issues and distortion in the fabric, but that was totally beside the point. In fact it seems that it was incredibly powerful and freeing to have one person coming in with no weaving background but a very strong idea of what he wanted to achieve, combining with weavers who having once left behind a lot of what they “knew” traditionally were able move far beyond weaverly concerns while still using their skills. Including weaving in the works made sense, emotional, intellectual, cultural and aesthetic sense. Plus having the three types of works/experiences together (weaving, painting, video) gave a lot of depth and context well beyond what a single work could supply. All the techniques added to the work, rather than the work existing because the artist wanted to use particular techniques. Things to keep in mind. 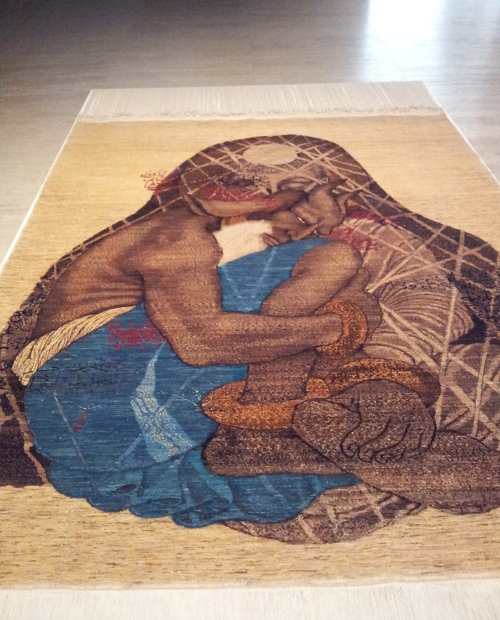 As a contrast in response to the artist’s cultural heritage of carpets, see Faig Ahmed – http://www.faigahmed.com/ and http://www.textileartist.org/faig-ahmed-remixing-traditions/. This post is not quite stripes, not quite weaving. I came across Polly Apfelbaum’s work while searching on stripes. Her room of stripes can be seen at http://www.artcritical.com/2014/06/02/david-cohen-on-polly-apfelbaum/ and http://cliftonbenevento.com/files/2013/04/APF_TheArtBlog_June2014.pdf. There are striped rugs on the floor and striped wallpaper on the walls. The stripes appear quite wide, creating a different visual and physical effect to those of say Jim Lambie (see 15-Apr-2014). Noreen Kress described the experience – ” the spatial boundaries of the architecture begin to disappear, blurred by the loud stripes of color. Complementary color choices paired side-by-side create visual tension—oranges buzzing against pale blues, vibrating with cool purples. In other moments of the painting, analogous colors rest next to each other, sharing a calm and gentle harmony. I reveled in the feeling of the undulating colors beginning to absorb and transform the physical boundaries around me—a feat of installation attempted by many and fully realized by few” (Kress 2014). Lambie’s stripes made me acutely aware of every slight variation in the boundaries of the MCA gallery floor. Apfelbaum’s appear to dissolve the boundaries of the space. 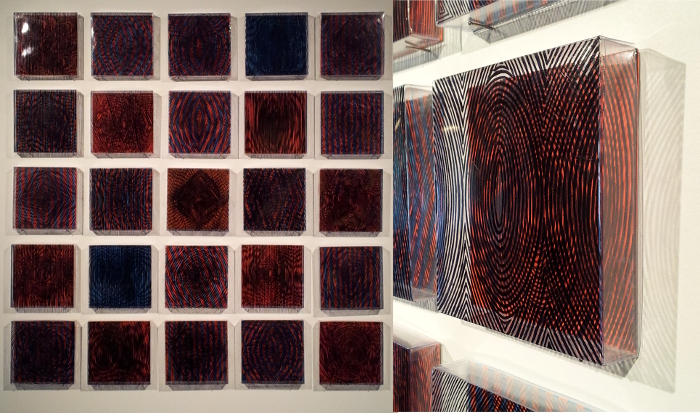 However given my recent post on the interaction of weaving structures and non-textile art (see 4-Oct-2014), Apfelbaum’s recent exhibition A Handweaver’s Pattern Book, at Clifton Benevento is fascinating – see http://cliftonbenevento.com/files/2014/05/APF_artinfo_June2014.pdf. Almost any weaver reading this will recognise the reference to Marguerite Davison’s book first printed in 1944. This classic book is devoted to four shaft weaving patterns. Although the photos are monochrome and sometimes dark or blurry, and the notation method is different to the modern forms and tricky at first, the book is an absolute treasure trove. Apfelbaum has taken inspiration from those photos and notations to create something quite different. Using a found punch-card Apfelbaum has created new patterns, drawing through the punched holes using marker pens, creating structured patterns on rayon synthetic velvet panels. Apfelbaum has referred to the works as “conceptual weavings”. There was a basic approach (a Serial Attitude? ), a framework and method, but variations depending on mood, age of the marker (new or running out of ink), the thoughts of the passing moment. There are grids on the panels and the panels themselves are hung to form grids. As well as the fabric panels there are hanging beads that Apfelbaum has made, like marks that have fallen off. Altogether the works create an environment. Apfelbaum describes it as the viewer “walking in a painting” (quoted in Indrisek, 2014). 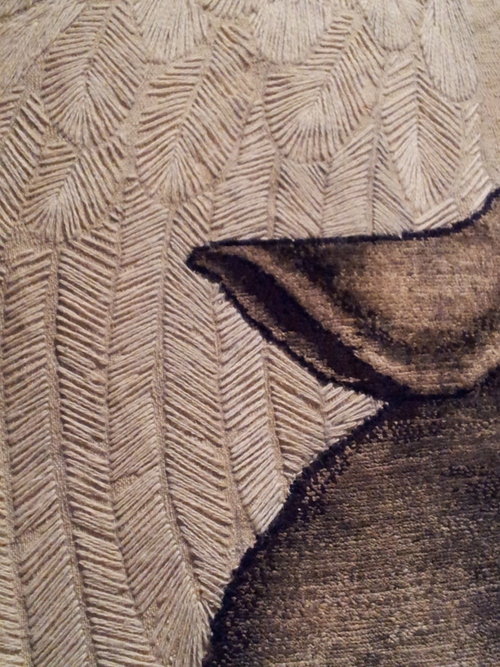 As a weaver I respond to the patterning, the sense of structure I see. 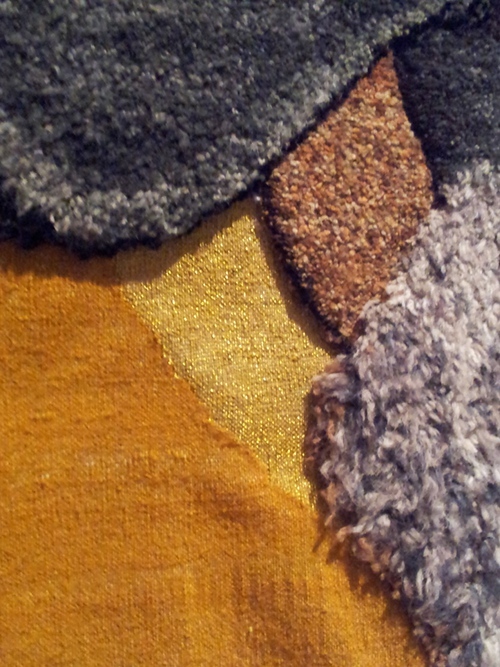 There is wonderful variation in colour, and given the work is still textile there is drape and an expectation of hand. The idea of beads extending the work is a lovely piece of whimsy. My final assignment in Understanding Art 1 – Western Art is with my tutor, so I have a small window of time to catch up on some exhibitions and events seen during the year. 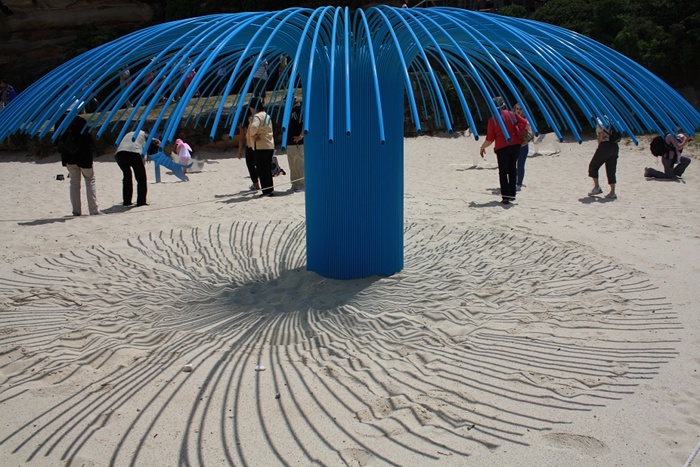 Cove Lines was one of a number of events in Lane Cove as part of Sydney Art Month. A community project, gallery staff conceived the display and developed a series of instructions. 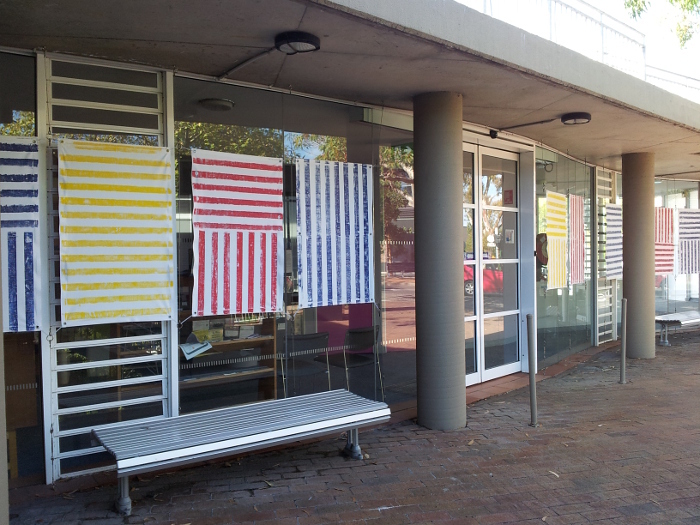 Students and staff at the community art centre, together with passers-by in the local plaza, followed the instructions to print banners, leading to the display in the Gallery Lane Cove forecourt shown here. According to accompanying material the curators, Felicity Martin and Laura Carey, were “inspired by the conceptual art practices of artists from the 1960’s like Sol Lewitt, who forged a new way of looking at art and the production of art”. Upstairs in the Gallery was Grid Line Pattern: a serial approach. Also curated by Martin and Carey, this exhibition title was a reference to ‘A Serial Attitude’, a 1966 essay by Mel Bochner in which he “identified artists who were working in a serial way, ie, they were concerned with the repetition of a standard unity, where the aesthetic was the result of this process”. 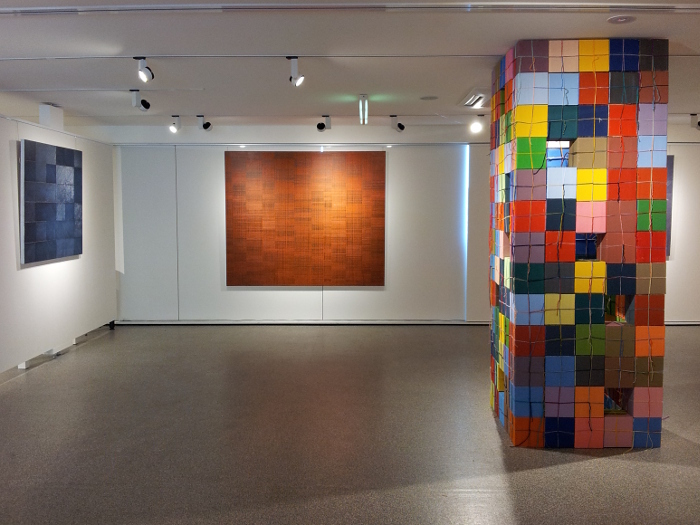 The artists included in the Lane Cove exhibition all worked with standard units of some kind, but continued to make aesthetic decisions throughout the making. Wendy Kelly showed a number of large canvases. The colour is rich, varied in detail, and intense. The patterning is very subtle. I believe Kelly stitches into the stretched canvas to create linear patterning and rhythms, then layers pigments, tissue paper, glazes etc to create the final luminous surface. An essay on Kelly’s website references the traditions of weaving and to me it certainly reads as weaving patterns on a very large scale. Kelly’s PhD work led to a publication “Abstraction and its Processes: An Historical and Practical Investigation into Abstract Visual Language”, and the Amazon blurb includes “Kelly demonstrates that her own highly process based serial imagery is seated within what is termed as the fourth generation of Abstraction, and addresses the current concerns of non-representational art”. I wonder if she started in textiles, as a weaver, or if her interests in abstraction and serial process led her to weaving structures as a resource. Nadia Odlum was the third artist included in the exhibition. 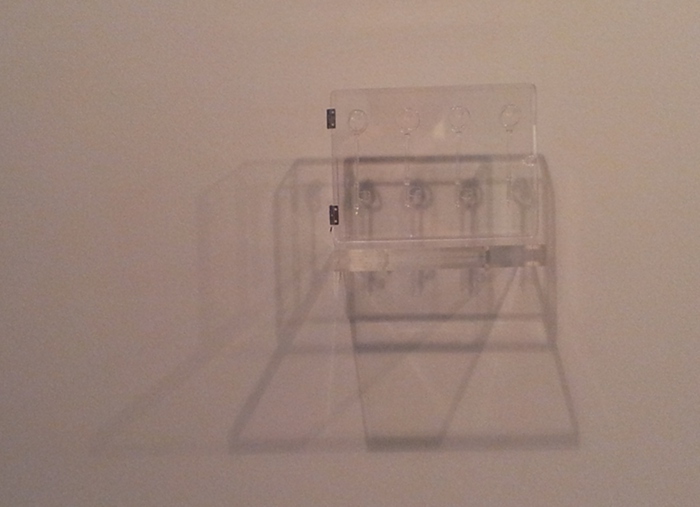 Nadia obviously works with optical manipulations and from material on her blog seeks to make the viewer “complicit in the questioning of their own mental and perceptual faculties.” (http://www.nadiaodlum.com/?page_id=31). The small studies shown above were clear plastic boxes with lines applied on the surface, and different broader striping on the back. 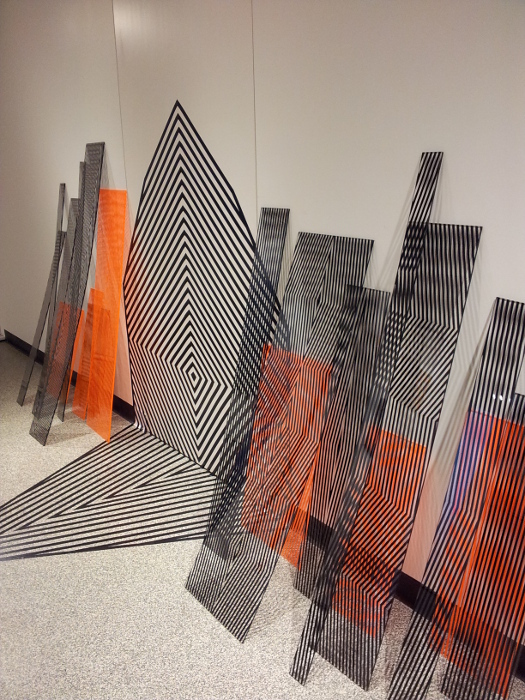 Similar ideas on a larger scale were used in the installation also included in the exhibition. The interacting stripes and shadow shape space in a way reminiscent of traditional cross-hatching in drawing, and of course as a weaver I saw many connections to textile work as well. 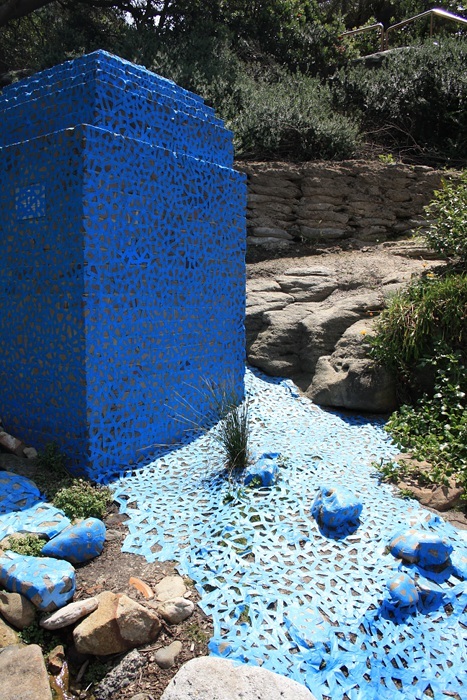 On her website Odlum includes some photographs of stripes added to the environment using coloured tape (see http://www.nadiaodlum.com/?page_id=647). An intensified awareness of space and location is created, the applied lines echoing lines found in the envionment. 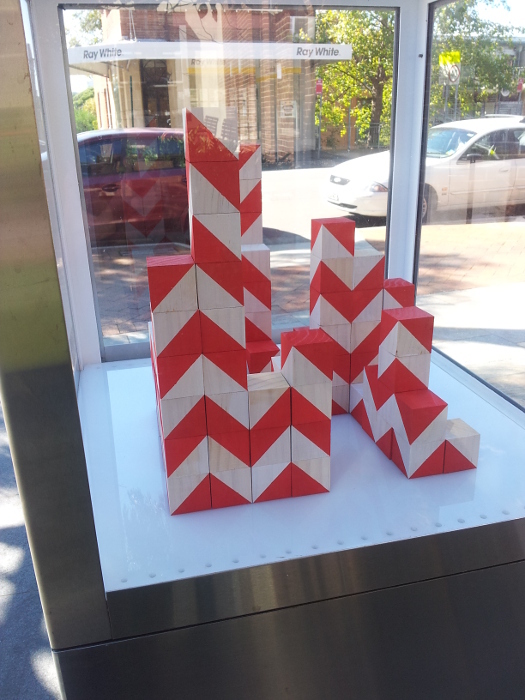 Also part of Art Month in Lane Cove was a work by Ruth Feeney – “inspired by domestic textile crafts like knitting and quilting, XXXX explores methods of pattern making through the repetition of a singular unit” (from the exhibition blurb). I would of course add weaving (in particular block weaves) as textile work repeating units. All of the exhibition had me thinking of my weaving, my studies, and all the potential paths ahead. Thinking of Bocher’s Serial Attitude – how important to me is the process, the repetition of weaving? Can I use some of his ideas as a starting point for some kind of weaving exploration? Kelly’s work had me thinking about scale. A weaver spends so much time designing structure that is often invisible to the casual observer. Can I scale up weaving to bring those structural considerations to the fore? All the artworks seen above have clear links to textile work – but none are textile work. How committed am I to textiles versus textile processes? These photos have been sitting on my PC since last November while I tried to fit them into a post about modern art and movements and labels and what is art and … Really, this is Art to be experienced. I don’t want to dissect it or label it. 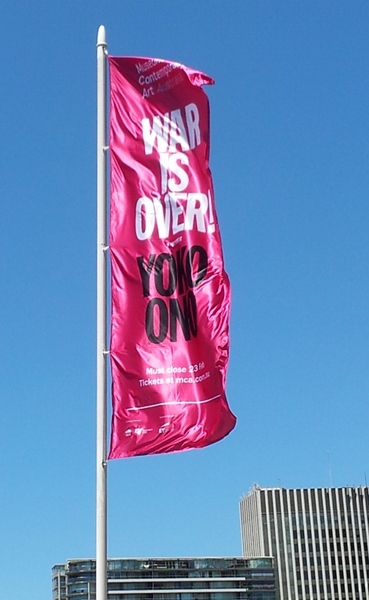 I visited this exhibition at the Museum of Contemporary Art in Sydney this week. Click here for the exhibition webpage. The fine print below the title, not readable on the banner is if you want it. I went to a talk about the exhibition last November, together with other OCA students Kath, Claire (her post on the exhibition here), and Jackie (exhibition posts here and here). The ticket I purchased then has been sitting in my wallet for over two months. I finally got there in the last weeks of the exhibition because I thought I “ought” to. I resisted it. I expected to be irritated by it. I was right. At least in part this was a self-fulfilling prophecy. I went in with reservations, negative expectations – and I found / interpreted material to confirm them. This is a Very Bad Thing for an art history student to do. I didn’t go down without a fight (nice word in this context!). I tried to challenge myself, tried to try to find things interesting, thought provoking, enlightening – but there it is. If I had to sum up this exhibition in three words they would be “pretentious, sanctimonious twaddle”. My first concerns related to the celebrity / John Lennon thing and the age of much of the material. This is at least in part the result of decisions by the MCA curator. There was quite a bit of John Lennon to be seen in the exhibition and quite a lot of the works had their origins in the late 1960s. Condemning war, promoting peace and understanding are still good messages, but can’t we expect a little more nuance, a little more depth, some development after 40+ years? It just looks a bit dated and … stuck. There was a really intense period in Ono’s life and she can’t leave it behind. Of course with the celebrity thing, we won’t let her. An example. A 1967 work with a title that means … what? Open the skies?? 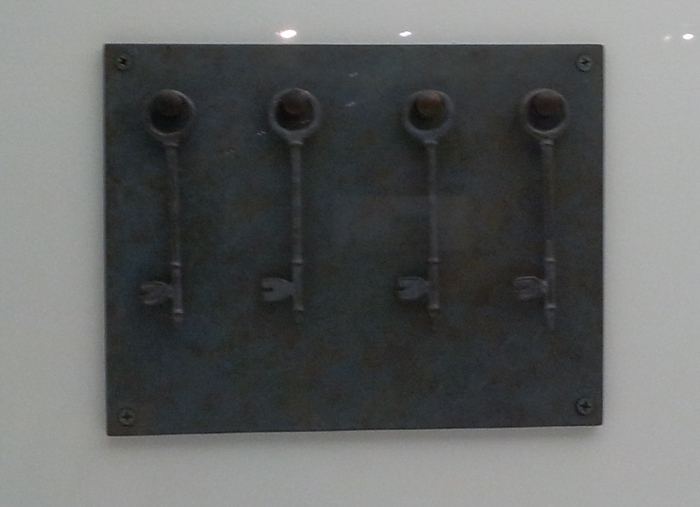 This was one of a series of work displayed together, and on a nearby wall was a later series. That sense of nostalgia, of holding on despite herself to past glory days, felt to me a dead weight in the exhibition. Another of my concerns was fuzzy logic and pious, portentous phrases with no actual content. 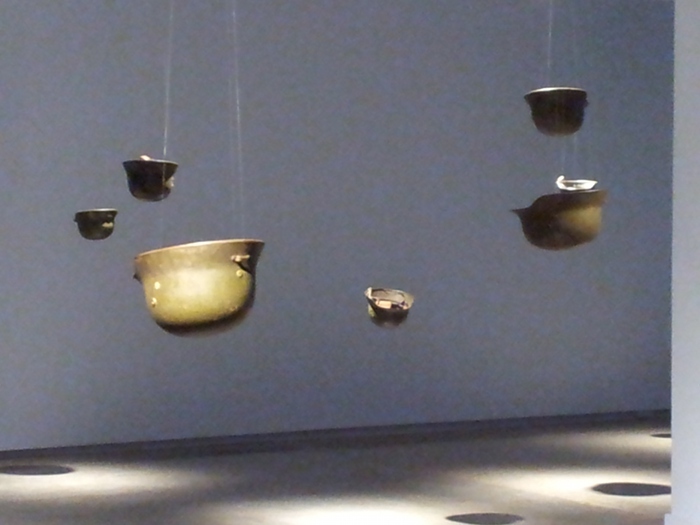 In this work we are presented with military helmets (apparently different origins in different installations) suspended from the ceiling. 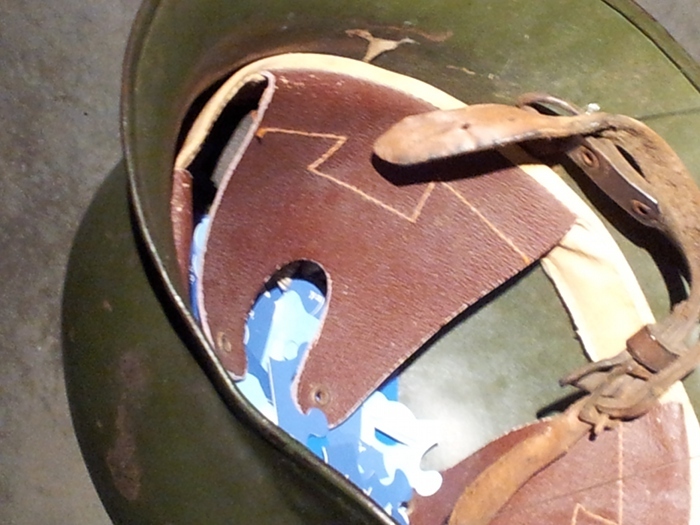 In each helmet are jigsaw pieces showing areas of sky. I chose not to take a jigsaw piece. Some of the other issues I can point to curator selection, language differences… This one I found squirmingly awful. The message: We’re all the same. In the end we all amount to a bottle of water. Look at this shelf of bottles of water all the same. Except the artist has chosen to name her bottles of water. Mary Shelley, Osama bin Laden, Virgin Mary, Nikolai Gogol, Isaac Newton, John Cage… There was a long row and given the number of names I recognized it seems reasonably likely that the rest are my ignorance rather than their obscurity. If the artist had named the bottles John and Mary or equivalents in every language and alphabet available the work might have resonated. Instead she chose to restrict her choices to a certain class of people – we’re all equal but some are more equal than others. (thank you Mr Orwell – I didn’t see his name but it could have been there somewhere). It’s a long time since the 1960s. We can’t get things just by wanting them. I’m sorry I wasn’t proved wrong by this exhibition. 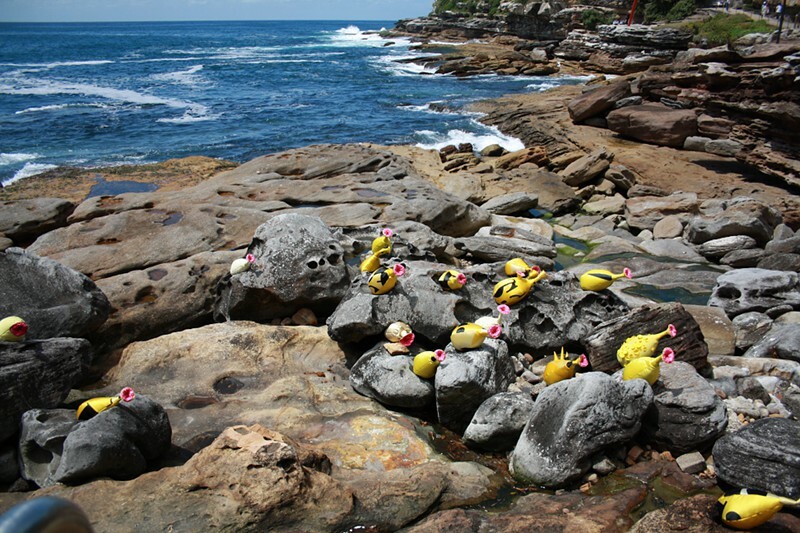 On Friday I visited this year’s Sculpture by the sea. See posts 2-Nov-2012 and 15-Nov-2011 for previous exhibitions. 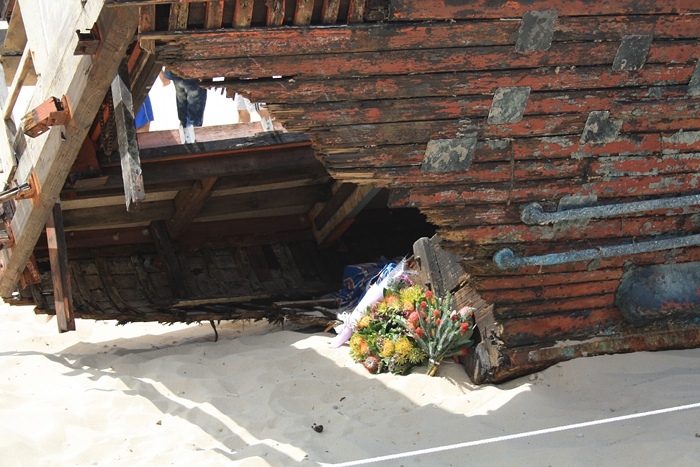 From a distance this large work by Tunni Kraus was an amazing wreck with beautiful textures in the battered materials. I had to walk closer to understand what was inside. Bunches of flowers, like those you see left outside gates or on roadsides where there’s been a fatality. “Asylum seekers” or “people smugglers and their customers” depending on your politics. Look past the rhetoric and mourn those lost. This is just part of an installation of small greenhouses on bamboo rafts. The artist’s statement: “A commemorative work to all nomadic communities displaced from their homelands as a result of catastrophic events, social or religious conflict, or economic environments”. For me there was such hope, such positive energy acknowledging loss but looking forward to a fruitful future. How can we help people who have lost everything to begin building new lives? Perhaps make a start with lots of small, simple steps. 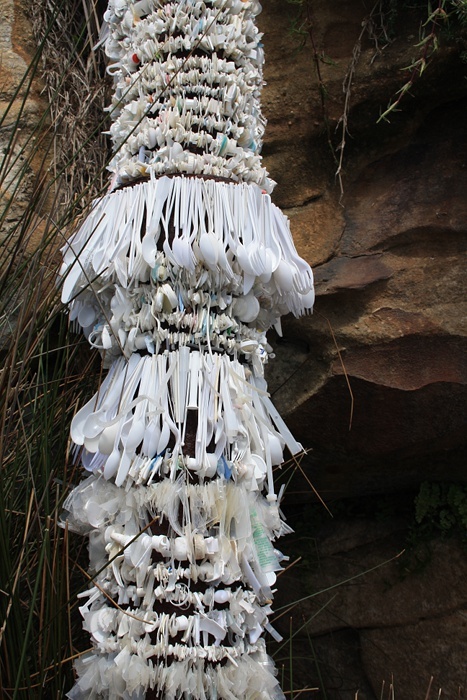 A strong sub-theme through the exhibition was around excess, waste and recycling. Some got a bit preachy, but others managed to get beyond their message to something interesting or beautiful. I love the texture and variety of this work by De Luca, which at the detail level reveals itself to be plastic rubbish from the beach wired together and wrapped around a rusty pipe. 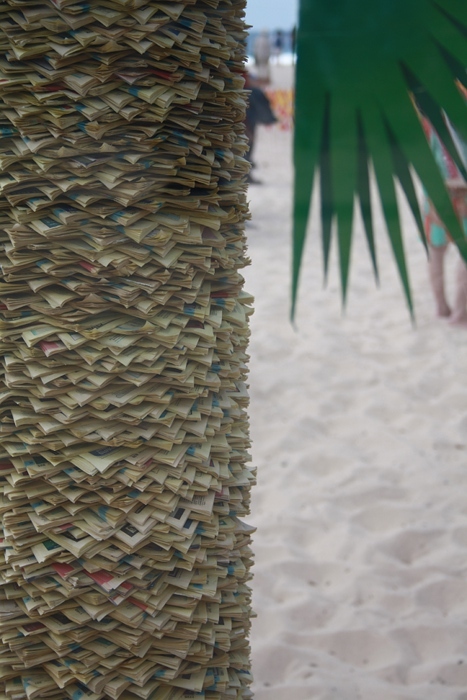 Keeping with the general shape of a column of texture, this “palm tree” by Tom Blake was made up of many, many telephone directories. Lovely texture and a nice witty title, but I thought it was let down by the green “fronds” that were plonked on top. The transition was awkward. 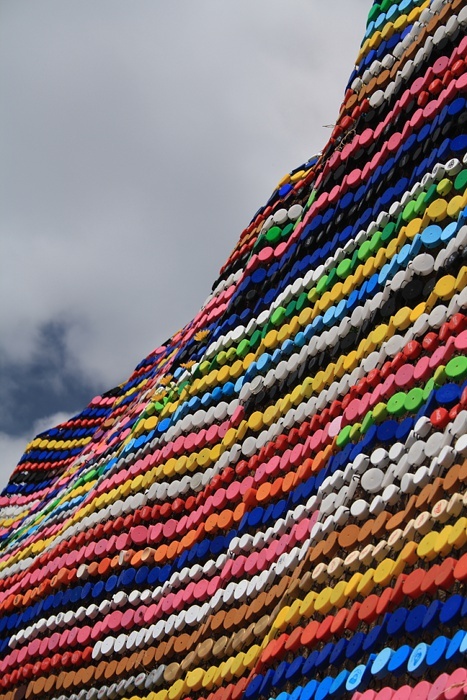 The materials in Alison McDonald’s work are described as “upcycled plastic lids, cable ties”. It looked like a huge crocheted blanket draped down the cliff, following contours and in some sections with brave little flowers showing through. It reminded me of El Anatsui’s Anonymous Creature which I saw at the MCA during Biennale last year (see 27-Aug-2012). In that case the bottle tops were aluminium, but it produced that same interesting contrast of draping in a hard material. I’m always looking for textile connections in artworks, and there is more in Margarita Sampson’s work. Not the best photo (click on it for larger. My closer ones were worse), but it does have the extra advantage of showing some of the crowd enjoying the day. I love the little creatures finding a home together in that rocky block (of flats?). 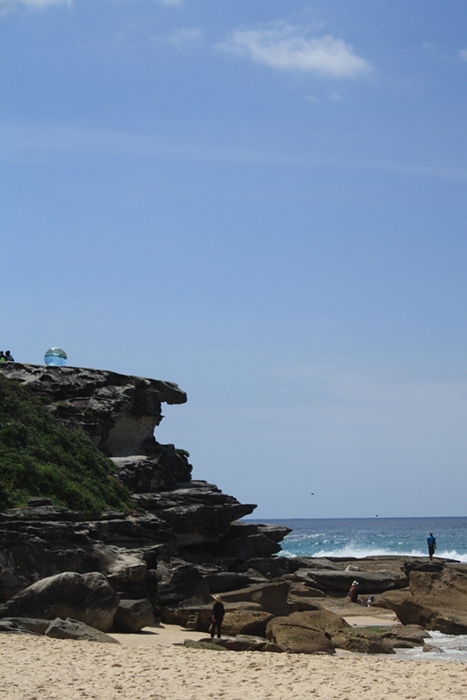 Bondi is (or used to be) known for shared households of students, backpackers and others with limited budgets – in fact when I first met my husband he was sharing a duplex just 100 metres away. Sampson’s work is an amusing reminder of the mix of people and oddments of collected and found furniture. In fact I’m pretty sure that in a similar spirit Sampson has reused parts of her work the yearning from 2011, which was displayed in the same area (see post 15-Nov-2011). The most overtly textile-related piece was this by Mikaela Castledine, in which she used crocheted polypropylene and a steel frame. 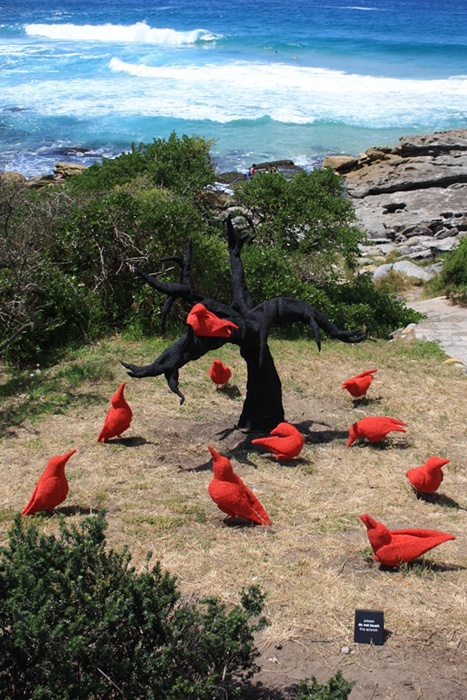 Her artist statement: “The legend of the ten red crows describes birds as bringers of enlightenment to a world not ready or able to accept it”. This takes me back to the recent question of mythological themes in art (see post 2-Nov-2013). I wasn’t familiar with the myth referenced by Castledine, and based on her brief statement looked at the work thinking of people refusing to listen. At home a quick search led to http://americanfolklore.net/folklore/2012/07/ten_red_crows.html and a longer version of the story which suggests the danger – the heat of the crows was destroying the land. The blackened tree in the sculpture depicts this, but I didn’t understand at the time. I see the image rather differently now and I’m glad I put the effort into learning and thinking a bit more. It’s a legend worth reading and retelling. In such an amazing place it’s very satisfying to see works that respond to the site. The artist’s materials here were masking tape and time. I think this is beautiful. It transforms a place by looking at it very, very closely and carefully. In one way it’s all about the idea – so clever, so unexpected – but the physical result for me works really well because of the combination of intricate detail and large scale. Every bump in the land is catered for, every rock and each weed and tussock. It reminded me of stained glass, say by Leonard French (see the amazing ceiling at NGV http://news.domain.com.au/domain/a-diamondcut-masterwork-of-coloured-light-20100618-ymg2.html), but in a way celebrating the earth and the place instead of light. 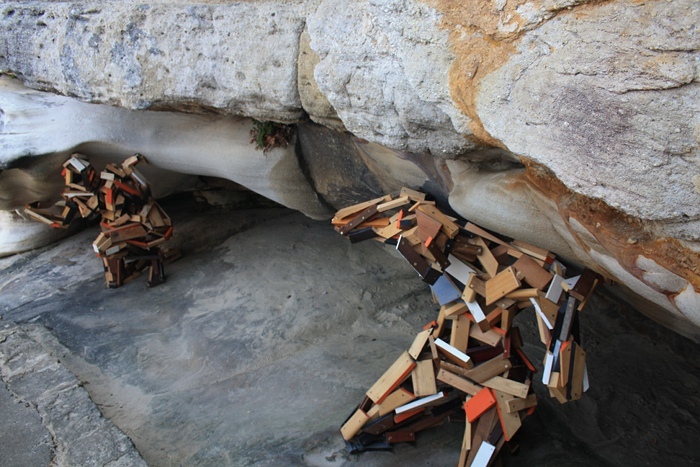 These crouching figures supporting the cliff face were fun and beautiful. Instead of the heroic, solitary Atlas of myth (! 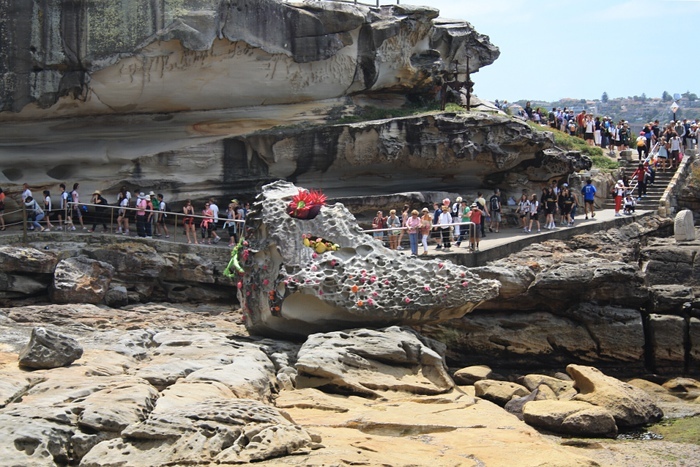 ), here two human-sized figures heave up the rock, sharing their burden. Maybe in a few moments they’ll gain their feet and the whole continent of Australia will tip over. Isn’t the pattern of shadows here wonderful? 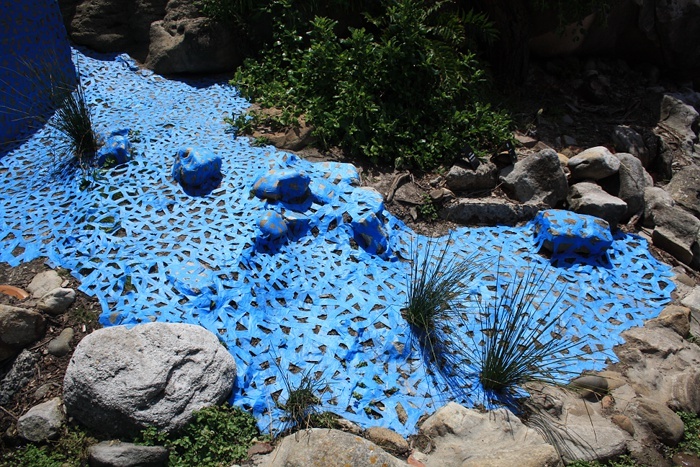 The aluminium “fronds” of this work were moving slightly in the breeze and combined with the uneven surface of the sand created constant change in a pattern that was so nearly but never quite regular. Mesmerising! 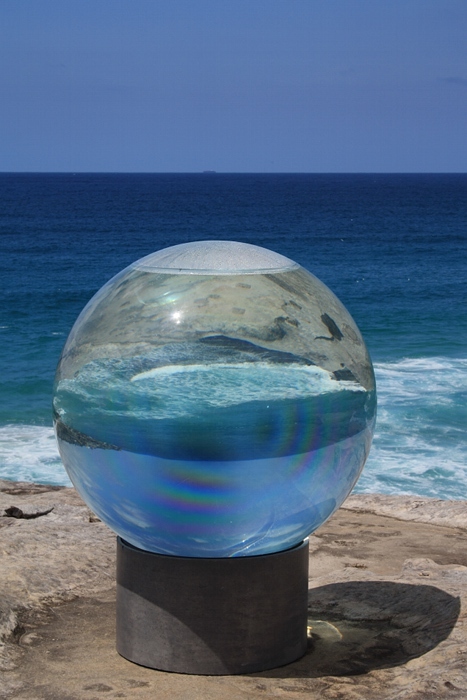 This bubble of water (well, acrylic sphere of water) was perched high on a corner of the cliff and from the beach below looked like some sort of earth-moon rising. It was rather a nice coincidence the next day at the NSW Art Gallery to notice the same cliff, this time looking towards the beach, with another moon rising. 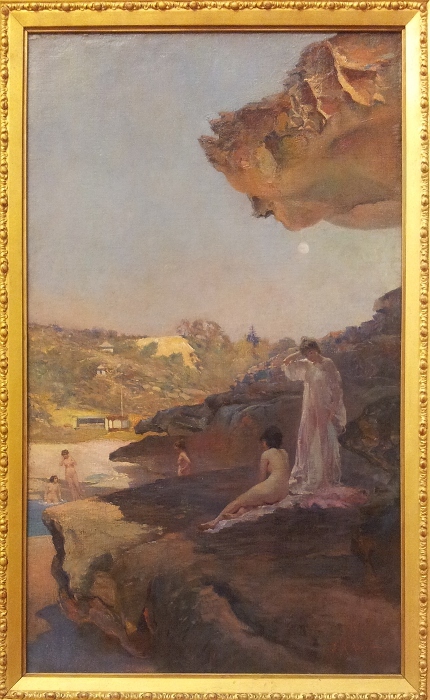 I was there looking at some of the “Australian Impressionist” paintings – more in another post soon! Details on this work can be found at www.artgallery.nsw.gov.au/collection/works/6535/. Returning to the present day, it was fun to stand up on the cliff, watching the waves below and the image reversed in Humphrey’s work. Just like the water, the wind was constantly changing, particularly on the highest point of the cliff. 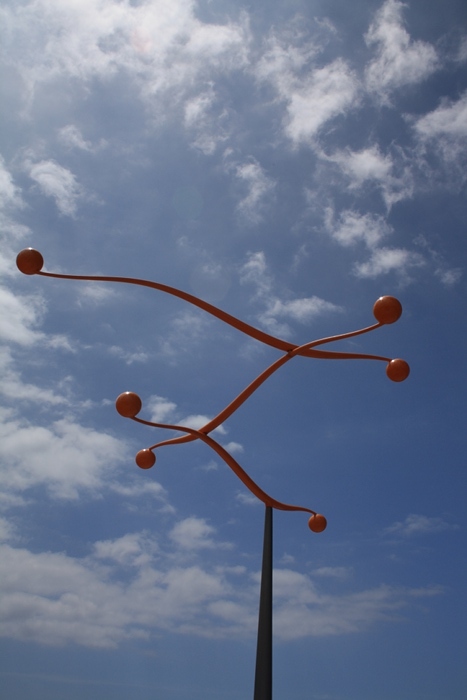 I took a series of photos of this work by Phil Price and in each one the shapes made against the sky were different. It was noiseless and seemed effortless, although I’m sure it took all sorts of cleverness and precision to achieve. Looking back at the last three works, they are a nice combination playing with the movement of light, water and air. The other constantly moving and irresistible force at the exhibition was the mass of people. Byung-Chul Ahn’s artist statement explains “the work depicts the transformation of life, from the simple form as a seed to the emergence of new life from within” but on that day at that place the life transforming and emerging was the crowd. 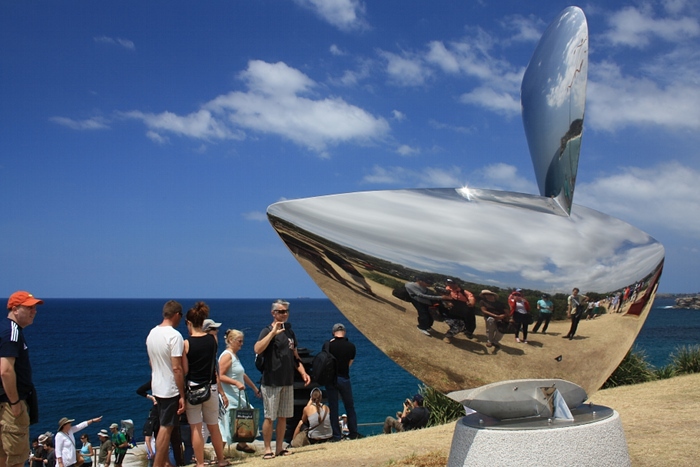 The sun was shining, on this high point the wind was buffeting, that beautiful blue sea was surging below – all of that, and the crowd, captured and reflected in this streamlined shape, encapsulating the day. 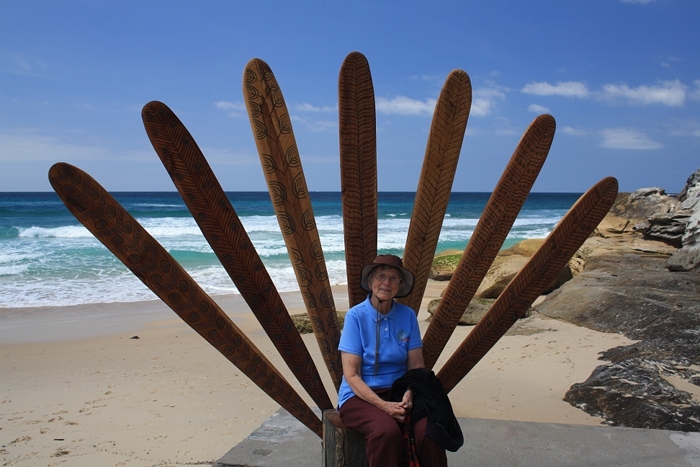 The final element – my mum, here mimicking a lyrebird. A wonderful woman, and I am very lucky to share such days with her. 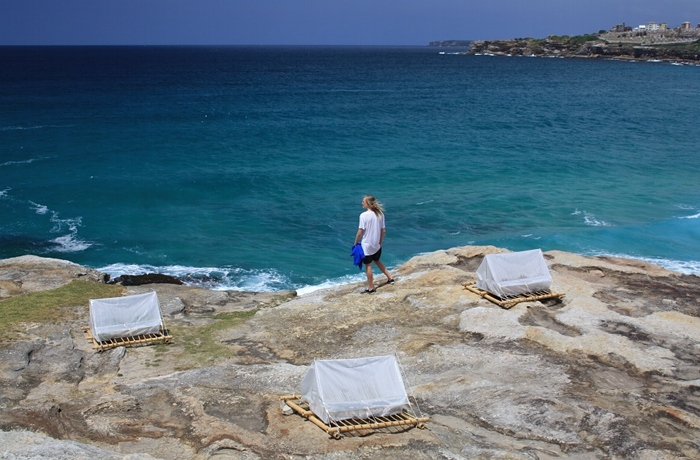 In the past week I’ve been to two artist talks hosted at COFA (College of Fine Arts at University of NSW) http://www.cofa.unsw.edu.au/events/cofa-talks/. * brief information about the talk:www.cofa.unsw.edu.au/events/archive/930. * Ruth’s website: www.ruthhadlow.net/ (take some time to explore it). * An interview with Ruth, focused more on travel to West Timor: www.smh.com.au/travel/frequent-flyer-ruth-hadlow-20120202-1qvao.html. Ruth grew up in Australia, married in West Timor and lived there for 10 plus years, and now is more in Australia but somewhere in between. Her talk, which she read, was mostly in english, sometimes in Bahasa. It was mostly in the first person, sometimes in the third. She told a lot of stories, but not a single linear narration. Her practice is not simple or contained in boundaries – for her, her practice is the same as her life. Her conversations, reading, thinking, writing, textiles – all parts of her practice. A hard part being how to “present” when there was no outcome or resolution, but ideas that may converge or coalesce for a moment then continue in multiple directions. Her talk was part of her practice, Ruth experimenting with her ideas as she read. A major strand was being other – the loss of identity living in a different world where there was no idea of “artists”, no galleries, an unknown language. Her life became a performance, an improvisation, where any feeling of confidence or certainty would be closely followed by a trip-up. In ten years no-one, not once, asked what she did. They were interested in family and social connections. Working on a PhD gave Ruth a lifeline – deadlines and purpose. She focused on small decisions and movements in the moment, on conversation as a tactic for making sense, on writing as thought made audible, visible, as if language constructs the entire world. Ruth spoke about the point where blindness and light meet, about exploring and processing, about the arrogance of familiarity, about response ability. Ruth’s slides of her work showed her writing on gallery walls, making shapes and patterns with words in pencil, or by pinning thread to the walls to make the shapes of words. She pins or hangs little shapes on the wall, or layers shapes of tracing paper and words. I feel I should finish this with comments about what this could mean in my work. Ideas about identity and light and layering all attract – but so far not even partial resolution. Pat started by showing us a slide of a gut parka from Alaska – you can see one here. Since she first came across it this material has fascinated Pat. It has qualities that she hasn’t found in anything else – the way light passes through it, how it can be shaped or wrapped around something when wet, how when dry it seems fragile but (if layered) is actually quite strong and stable, the organic shapes it forms. Pat uses other materials as well, but the hog gut (pig intestines more often used as sausage casings) is a major part of her work. She has combined it with rusty nails, creating marks that seem like a universal language. She has layered it into large sheets, capturing the marks made by a rusty door. It can be “dribbled” over sticks or objects to make flexible linear elements. The shapes Pat creates seem to become components that she mixes and displays in different configurations in various installations. It could look like lines of writing pinned to a wall in one orientation, then become a kind of ethereal shadow forest hanging from the ceiling. On a different twist in materials and scale, Pat showed us work based on knotted nets. In this case the work was scaled up hugely – it looked like she had knotted sheets – and then cast in metal to make gates. Another series of work was based on waxed paper, often old to-do lists, which Pat stitched on in waxed linen thread to form shapes and marks and words. When talking about her career history Pat showed us some slides of Turkish needle-lace used in edging headscarves. A woman’s dowry would include perhaps 40 headscarves, capable of giving a whole range of emotional messages. For example wearing a scarf edged with red peppers could mean arguments at home, while another scarf could announce a pregnancy. Still no neat conclusions, but this talk has me thinking about materials and conveying meaning. In Textiles: A Creative Approach we were encouraged to experiment widely with materials and that makes a lot of sense for students. A lot of Pat’s work has been done in one material – novel to most viewers but not, now, to her. It’s not that she restricts herself to it, but somehow knowing what she is using frees her to explore ideas.